What is “Blazing Star” mobile slot about? Blazing Star is one of the most popular arcade games by Edict Merkur, with classic fruit symbols and sparkling bright sun of slots, bringing you good profit opportunities for play and fun. Blazing Star is a very successful slot machine, delighted by many; as players enjoy it in the comforts of their homes, thanks to its compatibility in HTML5 for a wide range of mobile phones such as any Android or iPhone device and it works even free. There is no need to download an app to your device in order to get started. The game has a fixed jackpot of €10,000. Blazing Star is a game that is ideal for beginners as well as false beginners because it is constructed simple and easy to understand. If you want to try it without playing for real money right away, that is no problem. In this game a fun mode stands available, in which you can test what profit opportunities one has with the slot. The slot is played using five reels and five paylines. To win, you have to be careful that at least two symbols, better yet more of the same good fortune symbols are in a row – at one of the five paylines. But if five glowing suns appear on a line, then you can look forward to the highest prize of €10,000. You play with the following fruits that will bring you luck in the game: the grapes, plum, lemon and orange, melon and cherries. Per roll rotation, you activate five paylines. For this you can use a minimum of €0.05 or a maximum of €10 per spin. If you want to always play with the same amount, then you can activate the startup, that spins the reels automatically for you. 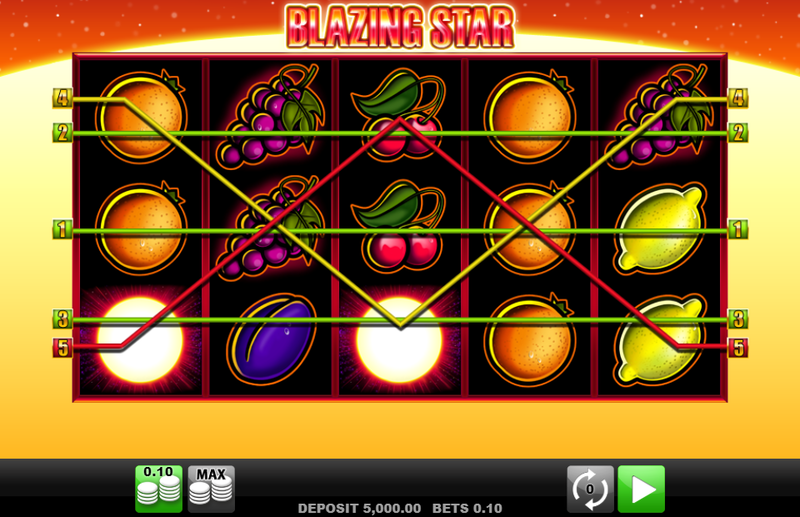 To collect a profit at Blazing Star, the same luck symbols should be read from left to right, appearing at least three times in the form of a fruit on one of the five paylines. Profit depends on the symbol form and the frequency of appearance of the line as well as the amount of your wager. The sun additionally, takes a special place in the profits. Here it stands for the highest multipliers and therefore also for the highest profits during your game. While only five sun symbols award you with the highest possible win, four suns still win you a respectable prize of €2,000.